As climate change affects shorelines, there are more and more reasons to consider planning a consultation for shore house moving. Regardless of the reasons, many homeowners find that homes which were once located a relatively safe distance from the shore are now in risk of water damage and complete undermining if nothing is done. Like their landlubber brethren, these homeowners know that their houses represent their number one investment in most cases. For some, acquiring or using more property to facilitate a move away from the shore will not be a problem. Many people own lots that can accommodate a move. Some can acquire lots that are adjacent to their property. Whenever possible, a short move may be the best one. To determine if a short move will work for you, take the time to consider the facts. Where waters seem to be rising and/or erosion is a growing factor, relocating your home a few hundred feet back might be only a band aid solution. Professionals in the field of shore house moving will be able to help you assess the situation for the best decision possible. Once the course of action regarding the move has been determined, it is a good idea to consider whether or not any structural or foundational changes need to be made. In many cases, homes were built prior to serious technological and industrial advancements that could be implemented now to improve the structural integrity and the strength of the home. Your shore moving professionals may be able to advise you regarding such innovations as helical pile foundation systems. Even when these systems may not be feasible for your moved structure, they may be implemented with the building of seawalls and other protective structures. 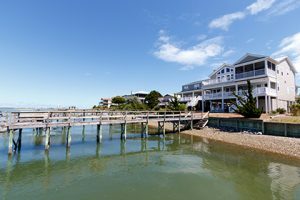 Shore house moving is possible, but it must be handled professionally and succinctly. Once you have consulted with a reputable company, you can deal with confidence and ease. The preservation of your home is your first step to high, dry living.